If you are facing Are blurry text or font issues on your Mac running macOS Mojave, then it’s due to the changes in anti-aliasing in order to aid the users without retina displays. There are a number of users with a non-retina display reporting that it’s blurry, or hard to read fonts after updating to macOS Mojave version. However, you might not know that just with some adjustments in font settings of MacOS Mojave, you can say goodbye to blurry text and font issues. After upgrading to Mojave, I also encountered this issue on my external monitor while surfing the internet with Google Chrome. I then quickly reported the problem on Google Chrome Help Forum to find solutions and I was not alone. There are also many users complaining about the same issue. However, it is not limited to Chrome browser, instead, it’s for the entire OS. So, I tried to find the easiest solutions to fix blurry text and font issues after Mojave update. If you are also encountering the same problems, simply follow the following methods to adjust font settings in MacOS to get rid of the thin text and font in your Mac Mojave. This tutorial also works for users running macOS Mojave through a Virtual Box. There are different methods in MacOS to customize elements such as font smoothening to fix blurry font in macOS Mojave. You can try performing different methods to boost up the performance of your Mac. But, in this post, I only show you solutions to remove fuzzy text in your macOS Mojave. There are currently three ways to fix blurry text and font in macOS Mojave. With these methods, you will be able to adjust font and anti-aliasing settings in your Mac MacBook Pro or MacBook Air to get rid of the fuzzy text. The first is just a simple setting change from the preference panel, but the other two methods are a bit more complicated and require you to use Terminal. You can either use all these methods or try each one to see the change. Once again, you should remember that the effected changes will be different from display to display and your eyesight. 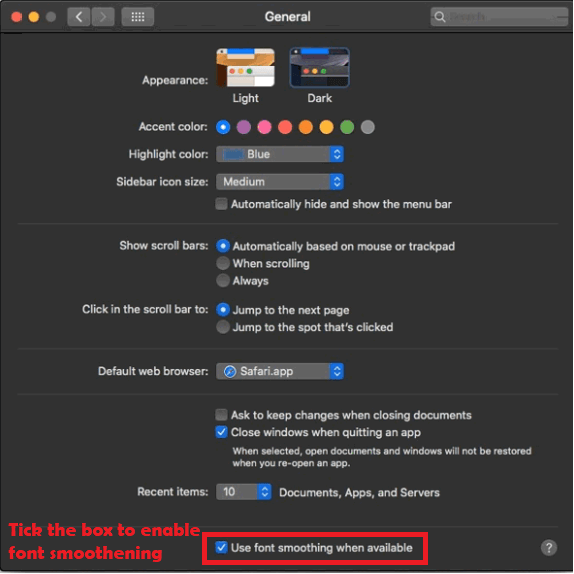 With this method, you need to directly tune into the settings panel to smoothen fuzzy text in macOS Mojave by enabling font smoothening in macOS Mojave. To do so, click on Apple icon in the top corner and choose System Preferences. Head over to General settings by clicking on General icon from System Preferences dropdown menu. At the bottom of the settings page, you will see “Use font smoothening when available” option. Enable it if it is already disabled. You can also do that by clicking on the checkbox on the left side. If the font smoothening option is already enabled, but it is not effective, you can then switch to the second method. You can also test the font smoothening settings by toggling on and off. If you see the difference, this easy trick is already good enough to fix the blurry text in Mojave. You don’t need to dig further deep into this post if this method is useful for you. But, you can try some other tweaks to adjust fuzzy text and fond deeper in your macOS Mojave. If the above solution does not work as expected, you can then try to enable font smoothening to fix blurry font and text through the Terminal on your Mac. 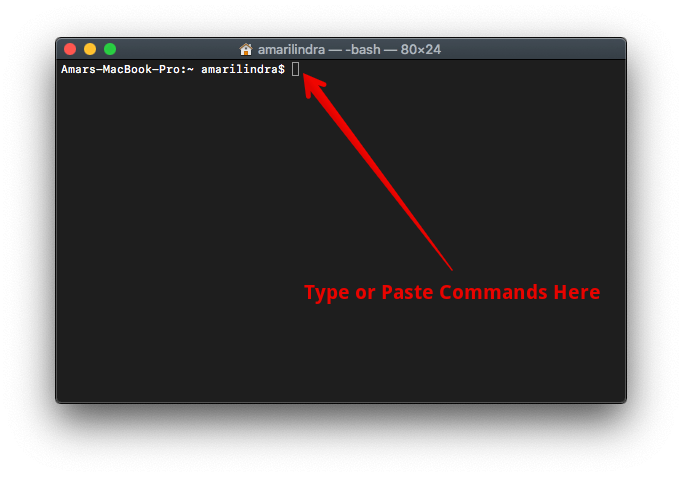 First, open the Mac Terminal by heading to Go> Utilities. In “Utilities” section, find “Terminal” app and then click on it to open the terminal. Once done, reboot your MacBook to apply the recently changed settings. For a few Mac users, this method is already enough to enable font smoothening as well as get rid of the blurry text and font in Mojave. But, there are many others that aren’t fully satisfied. Switch to the next solution to manually adjust anti-aliasing settings in MacOS Mojave. Head to Go> Utilities to open the Mac Terminal. Enter the following commands on your preferences. You can then try all three commands to see the difference. But, there is only the last executed command applied to System settings. After you run these commands, remember to log out and log in your account or reboot your Mac to apply the changes. The changes in font smoothening will depend on the current display. Individual preference might come to play after you adjust font smoothening settings in MacOS Mojave. If your Mac does not come with a Retina display, the quality cannot be the same after changing the font smoothening settings in your MacOS Mojave. Simply follow the above methods and find one that works best for you. If you are confused with the font settings, you can revert the changes and return to default settings. All you need is using these commands below to reset font settings to default in your Mac. Remember to reboot your Mac to apply the recent changes. That’s how to fix blurry text and font issues in your MacOS Mojave. If you feel this post useful, let’s know in the comment below.